An impressively detailed ash catcher heavily carved with lotus designs, scroll work and vine work. 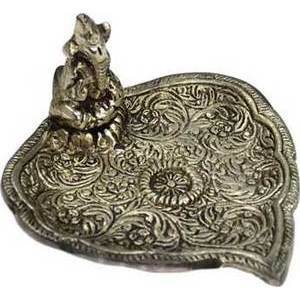 This ash catcher features a small statue of Lord Ganesh at one end. Suitable for burning sticks and cones. Silver plated brass. 3 3/4" x 3 1/2" x 1 3/4"